Is Josh Allen a Worthwhile Risk with the Second Overall Pick? With Kentucky's star linebacker registering three sacks and a blocked kick in the Wildcats' bowl game, Josh Allen pushed his sack total for the season up to seventeen. The dominant performance placed Allen in a brighter spotlight and created significant momentum to propel him to stronger consideration as a top five selection in the upcoming NFL draft. In a strategic move to preserve his draft stock, Allen pulled out of his prior commitment to participate in the Senior Bowl in Mobile, Alabama. This is a common move for top prospects, who can avoid the risk of injury or poor performance affecting their eventual draft position. The choice to withdraw from Senior Bowl week makes even more sense for Allen, from his perspective, but it creates a dilemma for teams looking to evaluate him as a primary edge rusher. Allen possesses every physical trait teams could hope for in a dominant edge prospect. He has height, length, flexibility, balance, agility, power, and explosive acceleration. At a positively chiseled 6'5" and 260 pounds with long arms, he looks like the archetypal edge rusher. The problem is that Allen was not exclusively developed or deployed as an edge rusher. Allen lacks refined technique and sophistication as a pass rusher, which makes the prospect of selecting him early a gamble. Unquestionably, Allen has shown on film that he is the best 4-3 outside linebacker in the draft, but 4-3 outside linebackers don't go in the top five unless they are also dynamic pass rushers. Allen is a productive pass rusher (seventeen sacks scream "hello! "), but he is so unrefined in how he achieves that production that his success on the edge could very well fail to translate to the NFL. Allen wins on the edge by simply being too fast and agile for the poor college linemen who are incapable of keeping up with him. Unfortunately, NFL history is littered with high-drafted, productive edge defenders who make their name in college by "out-athleting" the opposition, only to bust out in the league when the talent margin is tighter. For every Danielle Hunter who arrives in the league with a wealth of talent and hype (usually following an exceptional performance at the Scouting Combine) and a conspicuous lack of pass rushing technique, there are several first or second round busts that never develop the requisite skills around their special talent to thrive on the edge, like Vernon Gholston, Aaron Curry, and the 49ers' own Solomon Thomas and Eli Harold (now with the Lions). It is worth pointing out that Hunter, the least hyped and most successful of this group, was selected in the third round. High quality sacks and pressures occur when a pass rusher is required to defeat the block of an offensive lineman who sets to block the rusher. 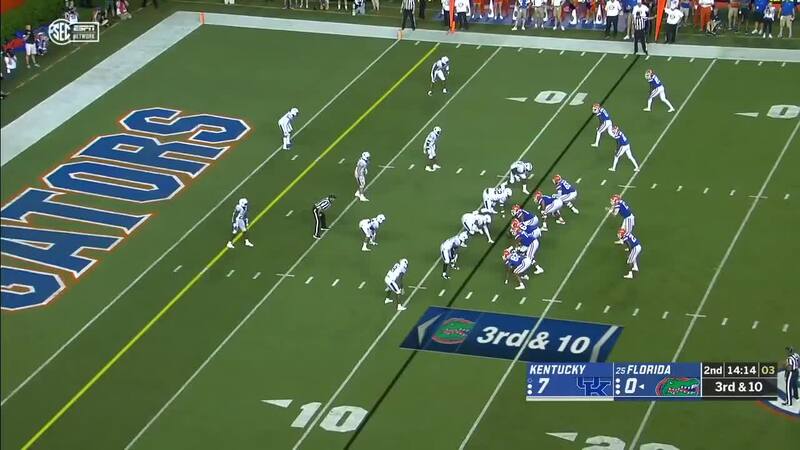 Allen's versatility allowed Kentucky to drop him into coverage often, which frequently resulted in offensive tackles failing to account for him when setting the pocket. Allen collected several unblocked sacks because he did not rush immediately at the snap, causing the tackle responsible for him to expect him to drop into a zone. They respond to his hesitation by turning to block another player, leaving Allen an unimpeded lane to the quarterback. Those are low-quality sacks, which are not easily reproduced in the NFL. When assessing an edge rusher, you have to watch who he wins against and how he wins. Some of the best pass rushes you will ever see don't end up on the box score because the quarterback gets the ball out right at the top of his 3-step drop. Box score scouting (determining a prospect's worth simply by reading his stats) can be misleading. For example, Richard Sherman was dominant in the 2018 season, but his basic stats would indicate that he was largely a non-factor as a pass defender. His coverage was excellent, but you'd never know that if you looked at his totals for passes broken up and interceptions. In fact, his coverage was so good that quarterbacks hardly threw his way, indicating tremendous respect for his play. Josh Allen is special. His athleticism allows him to change direction faster than an average college offensive lineman can mirror. He does his best work in space, rather than in contact, and he applies that as well as he can to his pass rush plan. Allen can burst off of the line of scrimmage and run the arc to win with a very good edge rush, but he will also hesitate and attack after the offensive line commits to a protection and the pass protectors set to block committed pass rushers. He is then quick enough to sprint into the backfield and avoid contact with any blockers on his way to the quarterback. An elite edge rusher should be able to win consistently in three ways: outside, inside, and with power (usually converting his speed rush to power). We will look briefly at how Allen performs at these three aspects of edge rushing. The outside rush is the key component of edge rushing. Effective counters and twists (two-or three-man line stunts) require the offensive tackle to be focused on the threat of an outside rush. An effective outside rush can be a combination of acceleration, balance, and bend that allows the edge rusher to explode upfield and corner tightly around the edge (think Vonn Miller). A less twitchy or less flexible edge can still be productive by using powerful hand technique and optimal strike timing to displace the tackle's outside shoulder, creating a less sharp angle to corner around to the quarterback (think Terrell Suggs). This is where Allen shines, even though his outside technique is still underdeveloped. His exceptional get off, acceleration, and bend allow him to win the edge before the tackle is even set up, then dip under the block and around the edge while the tackle attempts to recover. The acceleration and bend are traits that are typically associated with dominant edge rushers, and Allen is unquestionably blessed with an excess of both. Even with underdeveloped hand technique, he dominates on the outside, and he occasionally flashes effective chops and swipes. If this was all one should expect of an edge rusher, I would enthusiastically describe Allen as the rare elite prospect who still boasts tremendous upside. In the clip above, Allen's inconsistent hand technique produces an ineffective swipe, failing to disengage the tackle's hands. The result is Allen getting overwhelmed, engulfed, and pancaked. Allen's attempt to spin back inside is late and tentative, and his failure to throw an ice pick with any violence to it allows the tackle to recover and hold Allen up long enough for the quarterback to get out the throw. Even though the tackle clearly overplays the outside rush and he is out of position when Allen spins, Allen's poor technique costs him an otherwise easy quarterback sack. Josh Allen has tremendous potential as an edge rusher. His physical tools allowed him to dominate in his senior season, but his technical prowess leaves much to be desired. The typical argument in support of a prospect like Allen going early in the draft states that technique can be learned with time and effort, but talent like Allen's cannot by reproduced by any amount of practice or exercise. While that statement is true, it begs the question: If it is so easy to learn pass rushing technique, why hasn't he learned it yet? High school students display more advanced technique than Allen's on their Hudl highlight reels. Instructional videos can be found on YouTube. Even if Allen was not receiving adequate instruction from the staff at Kentucky, all the moves he would need have been made available to the public through easily accessed media. Again, maybe he can learn it all AND habituate to the movement well enough to time his moves and counters instinctively, but he's done nothing to demonstrate any of that yet. While many evaluators choose to value athleticism over talent, I have seen teams come up empty too many times when they draft a prospect with a high pick, assuming that the athlete will develop a skill that he hasn't produced yet on film. That is not a gamble I would usually be happy to take with a day three pick. For a prospect as talented as Josh Allen, I could see bending that standard to take him as a developmental prospect as high as the mid/late first round, confident that he would be an extraordinary SAM linebacker until he acquired effective edge technique. When Allen elected to skip the Senior Bowl, evaluators lost the opportunity to see him apply NFL coaching to acquire legitimate pass rushing technique and apply it against NFL-caliber prospects in Mobile throughout the week. Absent this opportunity to see how Allen's skill set improves with coaching, it is not a good risk to take Allen with the second overall pick in the draft and hope that he can become something he hasn't clearly demonstrated that he can be. Comment: This is exactly what I said about Allen a few days ago in some forum. He has an outstanding speed and athleticism but he lacks the pass-rushing skills that we´ll need at DE on passing downs. You can win with speed in the NCAA but in the NFL you´ll need a lot of moves to defeat the tackle and Allen hasn´t shown that he can do them. 4 years in college and no pass-rushing skills shown has to be concerning for NFL scouts. If Bosa is gone by our spot I hope we don´t take this kid at #2. BTW I´d like an analysis about Montez Sweat because I see some skills in that kid that would work in the NFL. Response: I can do that. There's a lot of time between now and the draft. I'll probably look at the top end guys first, but it makes a lot of sense to look at the Sweats and Fergusons of this draft if Bosa is gone and Williams is sitting there at 2, or if the 49ers trade back far enough to make someone like Metcalf a good value.